Our folks thought it would be high humor to take a picture of Daisy and me sitting at the dining room table, and then paste in a picture of the table all laden down with the Thanksgiving feast, so it would look like we were patiently waiting to eat. (And we all know that the only way that such a photo could exist would be to fake it.) So we were each hoisted into a chair and arranged into position. And we were having none of it. We know we’re not supposed to sit on the dining room chairs, so we jumped down in much less time than the 1/60th of a second it would have taken to snap the shot. We are very good dogs. 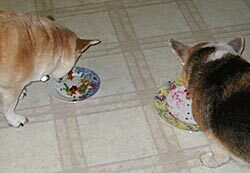 So, instead of eating at the table, eventually we were given plates of little bitty pieces of people food. I believe we got more than our share of peas. And it turns out we like acorn squash. 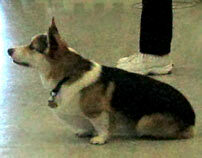 Today I went to the Corgi Faire with my folks. 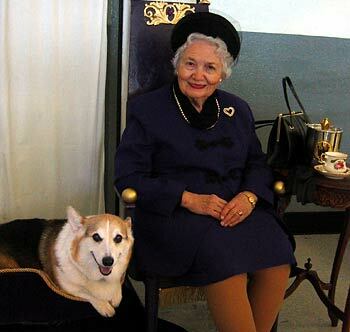 The Corgi Faire is where Corgis and their people get together to have fun. Here are some pictures. 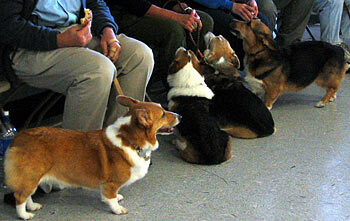 There are always lots of Corgis. 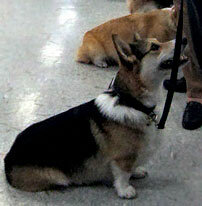 There are so many Corgis, that sometimes, across a crowded room, I would see a Corgi that looks just like me. But it’s not. We have all kinds of fun. I had my picture taken with the Queen. 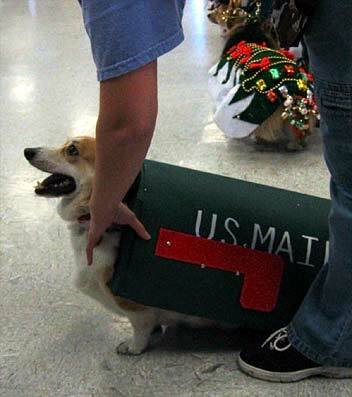 Fortunately, my folks did not make me participate in the costume contest. 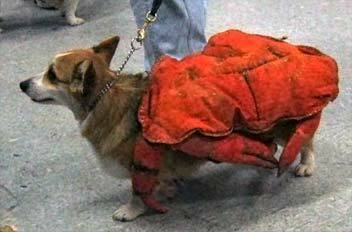 There were many cute entries, though, like this Corgi Crab. Here is a mailbox and a well-decorated Christmas tree. The mailbox seemed to sense that I understood her plight. 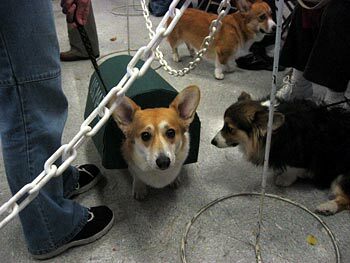 The best part of the whole Faire is a game called "My Corgi will eat that." A variety of foods are given to us one at a time, and if we eat it, we advance to the next round. They start us off with dog treats and Goldfish crackers, then progress to things like cauliflower, cherry tomatoes and radishes. I got eliminated on a coffee bean. Last year, I couldn’t choke down the Spanish olive. With such an interesting variety of offerings, I was quite... er, fragrant... on the ride home. I was so fragrant I woke myself up. It was a very windy fall day. Very windy. On my walk today, I had to duck falling leaves and falling branches, plus the occasional stray roof shingle. Then every once in a while, a big gust would launch me into the sky like a kite. It was very windy. Have I mentioned that I lie sometimes?